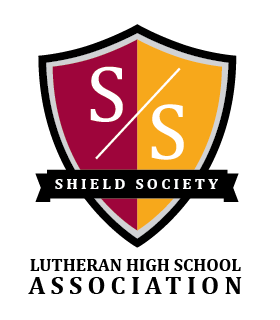 The Shield Society is comprised of individuals, organizations and corporations that provide significant financial support for the Lutheran High School Association, strengthening the tradition of excellence in our schools. The Shield Society honors donors for annual and lifetime support of the Lutheran High School Association and its schools, Lutheran High School North and Lutheran High School South. Annual membership is granted to donors with qualified gifts totaling $1,000 or more during the calendar year. Lifetime membership is granted to donors making qualified gifts of $25,000 or more, including Legacy Circle Fulfilled. With the graduating class of 2019, we introduced the new Builders Circle as part of our traditional Shield Society. This new circle of recognition is exclusive to our young alumni to encourage a strong and lasting connection to their high school. Shield Society Members are honored and recognized by the Lutheran High School Association through the following activities and benefits. Invitation to the Shield Society Appreciation Social. To show our gratitude, we now offer a selection of items you can choose from for your annual member gift. Including a leather portfolio, a long sleeved pullover with logo or the traditional member’s plaque and/or medallion. Exclusive Shield Society passes to all home games and non-conference athletic events, music performances and plays for the 2019/2020 school year. Receive the annual Herald publication. Listing in the next Annual Giving Report. Listing on Shield Society plaque displayed on each campus. The Legacy Circle is a part of the Shield Society. It honors and recognizes alumni and friends who have remembered the Lutheran High School Association and/or the high schools in their estate plans. Legacy Circle Fulfilled Members are now with our Lord and their estate gifts have been received. Legacy Circle Promised Members have developed lifetime giving plans that include supporting the mission and ministry of the Lutheran High School Association and/or Lutheran North or Lutheran South. Members have agreed to be recognized in the Legacy Circle.